Whether it’s boosting their analytical skills or building ties with the IT department, CCOs and other senior PR executives face a slew of new challenges these days. The pace of change in marketing communications is dizzying, of course, but it’s only going to accelerate. 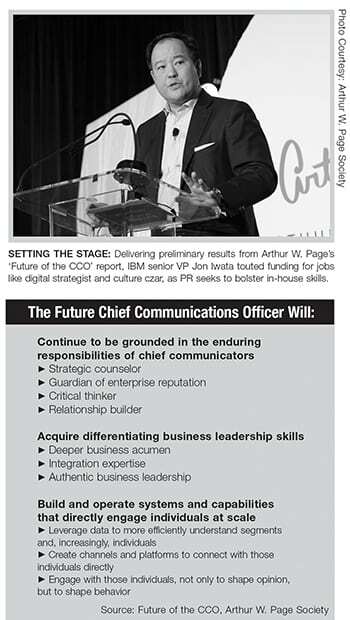 So it was fitting that the Arthur W. Page Society spring meeting in New York last week spent most its time focussing on future trends facing communicators. The major takeaway was that for PR pros the future is uncharted but, in light of some of the cultural indices, loaded with opportunity. But PR pros are going to have to put on their running shoes in order to capitalize on myriad changes. “The real story is not change, but the speed” of it, said Edie Weiner, president/futurist at Weiner, Edrich Brown, whose session “The 40,000 Foot View: What Does the Future Really Hold?” helped kick off the two-day meeting which was attended by more than 300 senior PR executives. One of the biggest changes expected in marketing communications is the advent of what might be called the Attention Economy, in which the ability to reach an intended audience becomes crucial to a brand’s ability to make money. Weiner pointed to macro trends that—from a business standpoint—will put a higher premium on CCOs’ performance and their ability to interpret what cultural changes mean for brand reputation and messaging architecture. ▶ A decline in critical thinking. 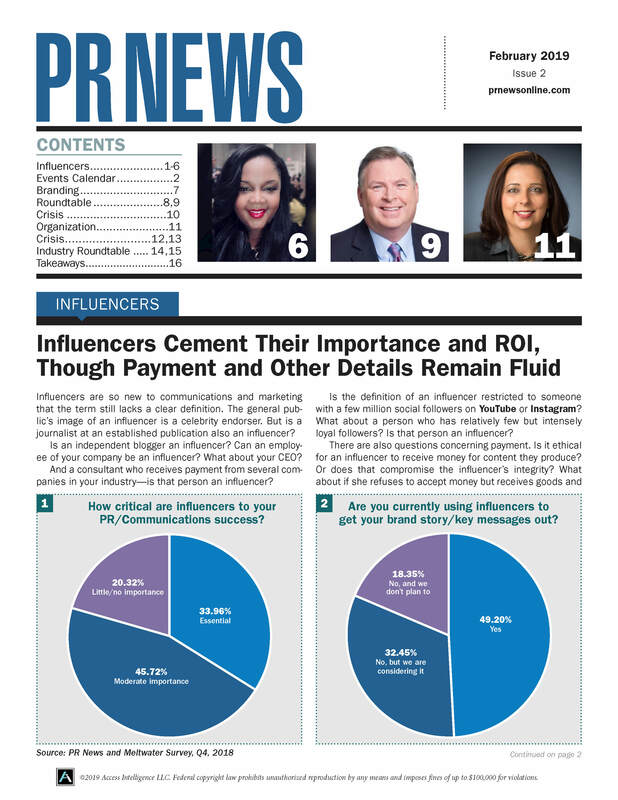 As information becomes ubiquitous and its distribution easier, CCOs and senior PR pros increasingly will be asked to provide context to the public about their companies, what they stand for and how they communicate. ▶ A crisis in trust. CCOs have to understand not just the “cliché” of consumers losing trust in companies and institutions, Weiner said, “but what’s at stake” for your brand and corporate reputation as a result of the ongoing erosion in consumer trust. ▶ Defrocking professional priesthoods. Weiner stressed that there’s a growing movement away from credentialed and institutionalized information and toward beliefs informed by an individual’s personal network. “In the future, you can’t just push out a message based on what you believe, but [the message must resonate with]what your audience believes,” Weiner said. As PR pros take on more responsibility for brand reputation, they also can expect increased scrutiny from the tippy top. Jon Iwata, senior VP of marketing and communications at IBM Corp., presenting preliminary findings from “The Future of the CCO” report, said CCO net engagement across the entire C-suite has grown 32 percent since 2010. The new survey, from a sample of roughly 200 responses, pointed to why PR’s future performance will be tied to technology: CCO engagement increased the most with CIOs (44 percent), followed by COOs (39 percent) and CMOs (33 percent). Asked where CCOs are most rapidly increasing their investment, social media came out on top (37 percent), followed by owned media (30 percent) and metrics and tracking systems (20 percent).